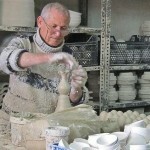 I travelled to Kutahya which is the centre of ceramic and porcelain production in Turkey. The town has a long history with the Ottomans taking control in 1428. Tile workers from Tabriz in Iran were resettled here and in Iznik in 1514 and it became the centre for the Ottoman ceramic industry.